It is a third sign of zodiac, Gemini & the fourth sign of Cancer. This cusp can be linked into younger period as the teenage is over. During this period cool air breeze and flowers bloom. Days are longer and nights are shorter that is why it is called the magic cusp. People born under this magical cusp are highly romantic & affectionate. They have the best of energies to be familiar with religion & philosophy with the same instinct they throw themselves casually into devotional activities. They always assert themselves as matured and know alls. They can easily be seduced and enchant others whether purposely or otherwise. Along with that they always keep defensive instincts also. Because of their charm and magnetic personality they are the most patient individuals. They can be easily emotional and make others emotional. They tend to private and prone to be in their inner world. An invitation to visit them can be a true gift because they are the best at their hospitality. They should away from isolating from the society if they want to be productive, otherwise it can lead to failures. They should avoid passive selfishness & think of people revolving around them. Though love is the primary reason for them whether it may be through difficult period. Many of them are in platonic love & even such situations are very special for them. They have tremendous capacity of love & are equally capable of beholding it. If you listen to them you will find the most affectionate and guaranteed persons, because they have wide range of interaction. At their career they win everybody’s heart with their affectionate nature to see success. Gemini-Cancer may conflict between their logic and emotions. They have the ability to find inspiration in the most ordinary of things. They do have a problem feeling complete unless they have love, romance and family. Gemini-Cancer needs to work on some things to be successful. First, they need to keep themselves from getting lost in ecstatic experiences. They may have difficulty finding themselves again. Repressing their feelings is a mistake. Destructive emotions can tear them apart; they need to learn how to deal with them and make them more positive. 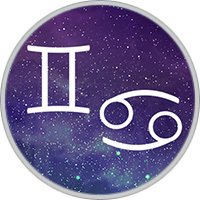 Individuals born on the Gemini-Cancer cusp are usually fond of children, but may not be able to maintain a marriage because their heart is so easily captured by another. It seems like someone always manages to pick up the pieces when they fail, no matter what realm their endeavor was in. They have magnetic personalities; they are the light bulb around which flutters the hapless moths. They are tolerant of others. They may become over-opinionated. They may enjoy activities such as genealogy, history, archeology and other related topics. They are always curious and active. They can brighten up family get-togethers. They are a bit sensitive emotionally, so they may have sudden ups and downs to contend with. Moodiness can be a problem at times. They do like solitude at times. They are affectionate, objective, supernatural, magnetic but along with that they are demanding & selfish also. Be little tougher than more emotional. Emotions can always play the role of self destruction.